The environmental organization Earthjustice is asking authorities to disclose the routes of trains that transport Bakken crude oil through New York State. Earthjustice attorney Christopher Amato filed the freedom-of-information request Thursday with the state Department of Homeland Security’s Office of Emergency Management on behalf of several environmental groups, including Adirondack Wild and the Sierra Club. Amato is seeking all records submitted by rail carriers regarding the oil-transport routes as well as any requests by the carriers to keep such records secret. Amato said Bakken crude is highly inflammable—“it’s sort of like gasoline”—and the tanker cars that transport it are susceptible to derailment and puncturing. 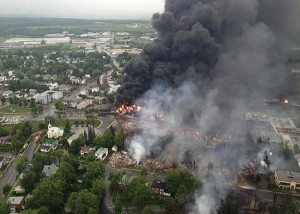 Last July, a train carrying crude oil derailed in Lac-Megantic, Quebec, killing forty-seven people and incinerating much of downtown. Since then there have been several other derailments. That latest occurred in April in Lynchburg, Virginia, where rail cars exploded after going off the tracks. “A few of them fell into the James River, and the river caught fire,” said Amato, a former assistant commissioner for the New York State Department of Environmental Conservation. Amato said the mayor didn’t know about the oil shipments passing through Lynchburg. In May, the U.S. Department of Transportation ordered rail carriers to notify emergency responders about their oil shipments. The Adirondack Explorer newsmagazine reported in its May-June issue that Canadian Pacific regularly transports Bakken crude through the Champlain Valley, sometimes within a few yards of Lake Champlain. Peter Cutler, a spokesman for the state Department of Homeland Security, said another rail company, CSX, also transports oil through New York State. At this point, the department is not disclosing the routes and schedules of either carrier. “Both have requested confidentiality on their shipping. That’s what we’re reviewing right now, and we expect to have a decision soon,” said Cutler, the department’s deputy commissioner for communications. Cutler said the department expects to respond to Earthjustice’s freedom-of-information request next week. Also supporting the Earthjustice request are Environmental Advocates of New York, Riverkeeper, the Center for Biological Diversity, Waterkeeper Alliance, and People of Albany United for Safe Energy.